Since graduating from law school, Michael Perry has exclusively practiced personal injury law. He has represented clients in accident and injury cases ranging from medical malpractice to slip and fall accidents. D. Andrew Vloedman is a civil trial lawyer representing clients in the Gainesville area and surrounding counties. Mr. Vloedman has jury trial experience in all types of accident and injury cases. 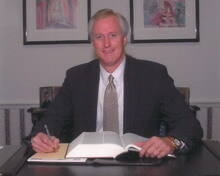 He graduated from the University of Florida, College of Law in 1981. Patrick Perry is a Florida Bar Board Certified Civil Trial Attorney. He has practiced law since 1981, and has extensive jury trial experience in many types of accident and injury cases. He has successfully litigated cases against many large U.S. and international corporations. Raymond Brady has practiced civil trial law in Gainesville. Mr. Brady specializes in personal injury and wrongful death cases, including motor vehicle accidents, medical malpractice, product defects, and premises liability cases.